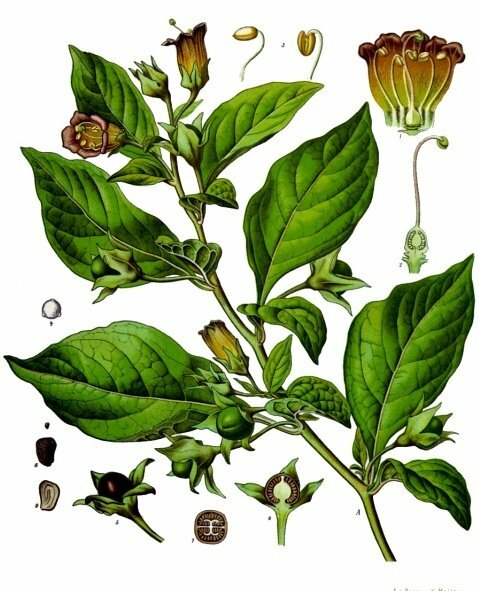 In nature, Belladonna (Atropa belladonna) is a perennial herbaceous plant in the family Solanaceae, native to Europe, North Africa, and Western Asia. Into our body, some of the phytochemicals in Belladonna (Atropa belladonna) are known to contain certain psychotropic substances (psychoactive substances). The foliage and berries are extremely toxic, containing tropane alkaloids. These toxins include scopolamine and hyoscyamine which cause a bizarre delirium and hallucinations, which are also used as pharmaceutical anticholinergics. The drug atropine is derived from the plant. Belladonna has a history of use as a medicine, cosmetic, and poison, before the Middle Ages, it was used as an anesthetic for surgery, the ancient Romans used it as a poison (the wife of Emperor Augustus and the wife of Claudius both used it to murder contemporaries) and predating this it was used to make poison tipped arrows.